The Strategic Freight Plan developed initial implementation guidance which outlines freight-supportive transportation strategies, facility design considerations, and policies within freight corridors and subareas. The guidance complements existing processes and takes advantage of freight-specific resources, including a multifunctional Comprehensive Freight Improvement Database (CFID) and a set of Freight Roadway Design Considerations. It identifies considerations for determining design solutions that support freight vehicle mobility, access, and operations in a number of urban environments. 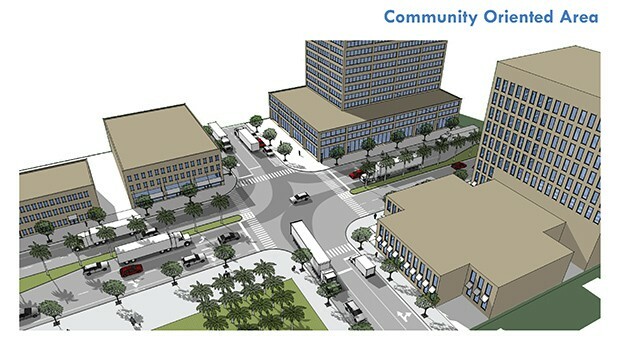 Intersections in COMMUNITY ORIENTED AREAS should be designed to accommodate trucks while optimizing the roadway operations for other vehicles and facilitating safe, comfortable and convenient pedestrian access. These areas often have constrained rights-of-way, a limited number of through lanes and shared turn lanes. Roadways should be designed so that smaller trucks can operate. Larger trucks need to be anticipated on the mainline facility, but may not be the appropriate design vehicle for side street conditions and turns. 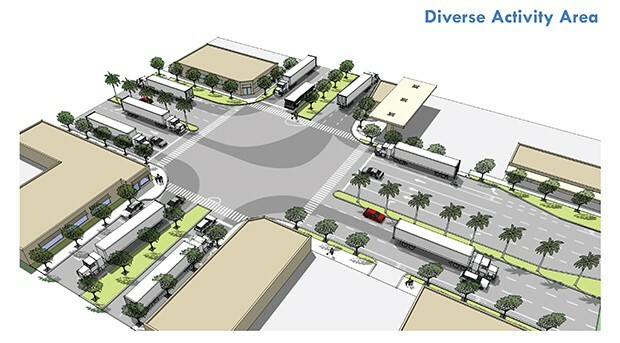 Intersections in DIVERSE ACTIVITY AREAS should be designed to facilitate truck movements while balancing the needs of other users of the roadway. This often has to occur in constrained rights-of-way where established curb lines, existing infrastructure and equipment and limited right-of-way widths shape truck-friendly solutions. 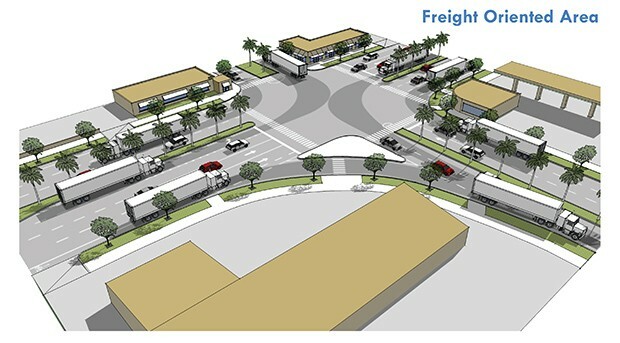 Intersections in FREIGHT ORIENTED AREAS should be designed to optimize the operational efficiency of trucks. This is particularly important where two facilities on the Freight Network meet, but applies generally to all intersections. Design elements such as truck channels for right turns, extended turn lanes to provide additional storage for trucks, and corner radii designed to accommodate truck turning movements. We have developed detailed guidance that specifically addresses freight roadway design considerations related to the context areas in which they exist. Check out the Freight Roadway Design Considerations page for more information.